I recently read Braving the Wilderness, Dr. Brené Brown’s newest book on the quest for true belonging in an era of emotional disconnection and political toxicity. I have long been a fan of Dr. Brown’s work; I try to reread her books Daring Greatly and Rising Strong every chance I get, and I am constantly recommending them to both clients and friends alike. I had very high hopes for her newest work, and let me tell you, it surpassed even my incredibly high expectations. Here is a mini-review of the book, including reasons for its potency and relevance, and some of my favorite takeaways. Brown explores to the rise of disconnection in our communities. She sees that our political parties have become gangs that leave no room for dissent amongst us. Perhaps more importantly, if we stay inside these bunkers, we lose the ability to connect with those on the outside. We are the most separated and siloed we have ever been, and despite being surrounded by the people who (likely) share our political beliefs, we are also the most lonely, isolated and disconnected we have ever been. So, while we may be gathered under the same bunkers of political ideology, we are really still alone. 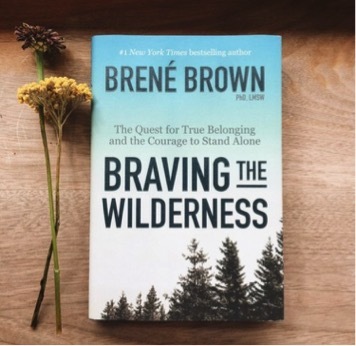 Rather than continuing to stay in our bunkers and stonewalling (or fighting) with anyone who has a different belief than ours, Brown encourages us to learn to stand in the wilderness and begin to have the hard and painful conversations. Only through these moments of real connection can we better belong to ourselves and to one another. To do this with any sort of success, Brown provides practices and tools that are meant to help us step into and become, what she calls “the wilderness”, both rooted deeply in our beliefs and integrity, and courageous enough to open ourselves to those around us even if we know it might not be popular opinion. We must choose courage over comfort and learn to embrace vulnerability. Both vulnerability and joy are the keys to true belonging. Boundaries: Set/Hold/Respect them. The challenge is letting go of being liked and the fear of disappointing. Reliability: Do not over commit or overpromise to please others or prove yourself. Say what you mean and mean what you say. Accountability: Issue meaningful apologies. Let go of blame and stay out of shame. Vault: Share only what is yours to share. Stop using gossip to hotwire a quick connection with someone. Integrity: Choose courage over comfort. Practice living in your values. Generosity: Be honest and clear with others about what is ok and what is not. Brown masterfully provides both research findings and anecdotes to better explain and unpack how these tools show up in our daily lives and why they are so integral to true belonging. One of my favorite sections from the book was a practice called: Hold Hands with Strangers. She teaches that collective joy and pain are the cornerstones of human connection; “seek out moments of collective joy and show up for collective pain.” These are the moments that reinforce our human connection, such as concerts, sporting events and even movies where there is a palpable force of love and connection in the audience. Have you ever felt an experience of collective joy? For me, singing songs arm in arm with my best friends at my childhood summer camp triggers those memories. Even the joy I experienced at a Beyoncé concert, singing and dancing with strangers who loved her the same way I do. They were moments that, although maybe silly, made me feel hopeful about the goodness of people. Moments of collective pain, such as funerals, or sitting with a friend who is grieving or hurting, are profoundly important - albeit much more difficult and uncomfortable. We need both. Brown shares a study that examined the impact of collective assembly. The findings showed that these experiences “contribute to a life filled with sense of meaning, increased positive affect, increased sense of social connection, and decreased sense of loneliness. All essential components of a happy healthy life.” The best part is, they have a lingering effect; we hold onto these positive feelings past the events themselves. Even since the rise of social media in the last decade, we have become simultaneously more connected and more isolated and lonely. Brown’s ultimate message resonates with me very deeply - if we want true, authentic belonging in this world, we first have to know who we are, what roots us and only then, can we turn outwards and engage with our friends and communities from a place of curiosity, vulnerability and shared humanity.